I got my Mocha about a week ago and got some good learning flights in. I kept it close to the ground and had a few hard landings, but everything was ok. So I decided to take it much higher. It flew well and then started having issues. When I landed it, one servo was loose so I glued it back in and got two good flights out of it before it started acting weird. I checked it again and the other servo was stripped. So I went to a local hobby shop, they couldn't find any markings on the server but suggested the hitec HS-65HB as a replacement. I installed the HS-65HB and power up the quadshot. The part centered itself like it was supposed to so I connected the rod, and went to fly it again. This time I let it hover for a little bit and it seems ok so I took it higher and then it started behaving erratically again. After a crash landing that seems to have ruined a motor I took another look at it. I let the blades spin very slowly while holding the quadshot. I then tested some of the flight directions and it appears the new servo reacts in the opposite direction that it should. I have lots of soldering and circuit design experience but very little RC/servo experience, so I'm not sure what is going on. I couldn't find anything on the servo package that would indicate which way the part will spin when the PWM increases or decreases. Any help would be appreciated thanks. Or code the Lia to change the direction of operation for the replacement servo (again a one line change in software). 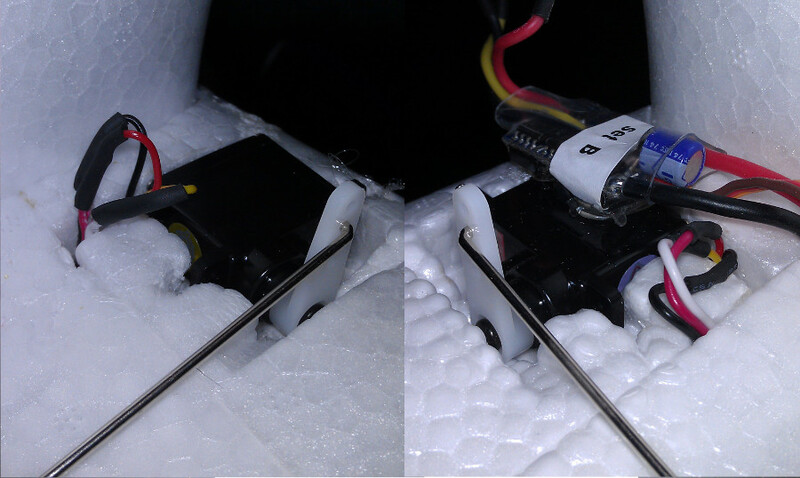 If you were to replace both servos and switch the connectors, would the feedback work correctly? I can't quite wrap my head around this one without seeing it. The best is to just email us so we can send you a replacement part. ..and sorry about the servo trouble, I hope it wasn't too much work to replace it. Did you open the foam or just solder it from the servo end? Thanks Chris. I am hoping I will get some pictures up soon. Although I didn't see any markings on the standard servos the wire colors matched futaba so I went with that. I didn't see a good way to replace the entire wire without tearing the wing apart but I was able to pull a little extra out near the servo so I cut the wires there, then solders and heat shrinked the connections. When I flew it the next time is when it was crazy and I did some testing to realize that the direction was wrong. http://www.horrorseek.com/home/halloween/wolfstone/Motors/svoint_RCServos.html Which talks about how there really is no standard, futuba rotates the opposite direction : ). I like the feel of the new servo so I think I am going to try and replace the other one and flip the code. I am worried about the the control loop, but hopefully the servo control is abstracted enough that the loop just tells it which direction to rotate and I can change that transparently to the loop. I will have to take some time and go through the wiki on how to program the part and I am not caught up on that. It looks like you have USB to JTAG so I don't need a jtag pod which is good. I assume there are free IDEs available but again, I just have to go through the wiki. Also, apart from it just being a bad servo (which is possible), my theory on why it striped was that moving to the max in either direction caused the rod to hit the wing and prevent further travel. If no one else has this problem though, it probably isn't a valid theory. Because of how they are geared, it's easy to damage a servo by backdriving it, especially if it's backdriven quickly. This is especially true of smaller servos. This can happen during a hard landing on a rough surface that doesn't contact the landing pegs before it hits the elevons or even during transport. If the surface was binding badly or had inadequate travel relative to the amount of travel commanded by the servo, this would most likely result in the servo overheating rather than stripping, and you can probably tell if that happened simply with the whiff test...if you are familiar with the smell of electrical smoke anyway! Please PM me if you need a hand with the software changes necessary to reverse the direction of the servos; we can setup a skype chat. They are near the top of the file, in the first block of code. Just swap the max and min values to reverse servo direction, reflash your autopilot via USB and you are done. I got swamped with work but the holiday break allowed me to start and catch up on some of my hobbies. I was able to get the second servo installed. In case you can't tell from the picture I wired black->black; white->yellow; and red->red. I also flashed to firmware with the changes suggested below. I used my VMware ubuntu installation to do everything in, the wiki instructions helped a lot. I ran out of time today so I haven't flown it yet, but everything appears to be working. I wanted to post a follow up just in case someone with a similar issue stumbles across this post. You may want to check your throw setting on that servo - mine is on the outer most hole, it looks like you have yours on the second hole. This may just decrease the travel range of the elevons and not cause any issue.